Two soap stars from Manchester have backed their "rival" city's bid to become a cultural capital with a 100ft abseil. Coronation Street actors Simon Gregson and Suranne Jones - who play married couple Steve and Karen McDonald - unfurled an 82ft banner of support in Manchester city centre. The "Manchester supports Liverpool" message is in support of Liverpool's bid to become of the European Capital of Culture in 2008. Coronation Street cast members and stars from the Liverpool-based soap Brookside watched the abseil at the Granada building with members of both Manchester and Liverpool City Councils. 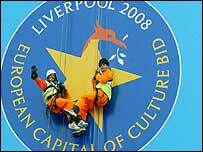 Mr Gregson said it was important to support Liverpool's bid and that he "loved every minute" of the abseiling. "We are neighbours," he said. "The one thing that stops us getting on is football, so it's time to put that aside." Liverpool is one of six British cities bidding for European Capital of Culture status in 2008. The decision will be made in June. Sir Bob Scott, chief executive of the Liverpool Culture Company spearheading the bid, said Manchester and the North West had "a huge amount" to gain by supporting Liverpool.